In today’s new normal of talent acquisition and job seeking, candidates and potential new employees gravitate toward companies that provide a hiring process that’s fast, easy, and ultimately, engaging and personal. 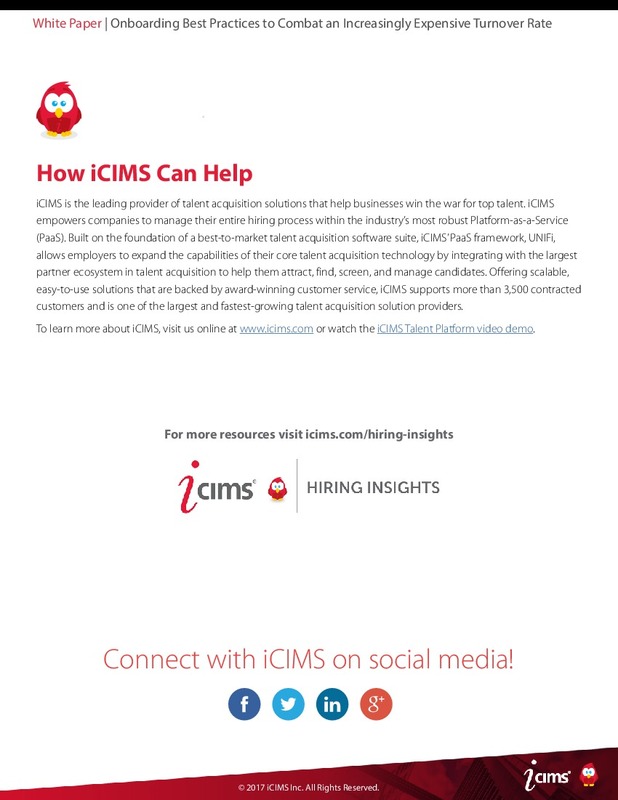 From sourcing, to recruiting, to onboarding, iCIMS provides the tools companies need to navigate through the ever-changing demands of today’s workforce. 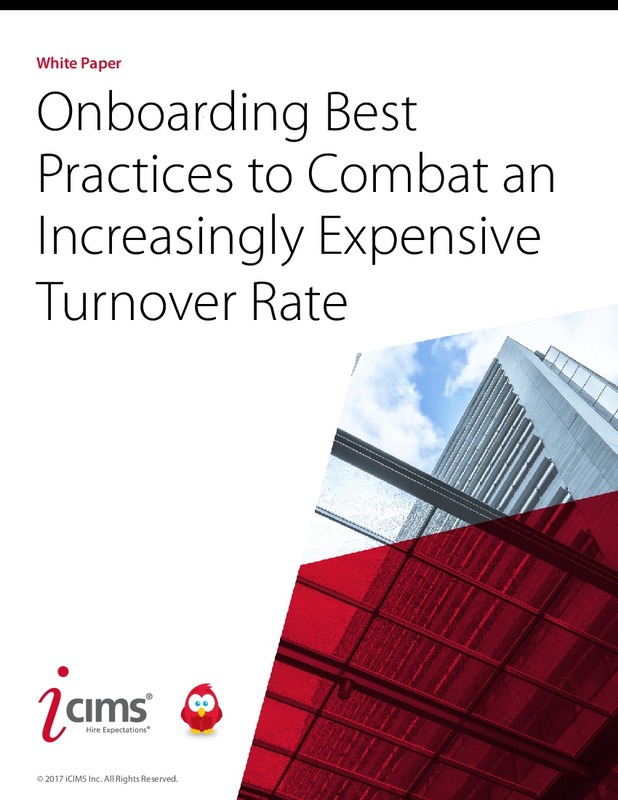 In this white paper, we’ll discuss how, in conjunction with iCIMS’ applicant tracking system, companies can use iCIMS Onboard and ensure that new hires will stay longer and perform better. According to SHRM’s onboarding study, nearly half of all hourly workers leave new jobs within the first four months and half of outside senior hires fail within 18 months. One way companies can improve these statistics is by use of strategic onboarding techniques that help employees assimilate into your organization. While every organization has different onboarding techniques ranging from a formal onboarding process to the sink-or-swim mentality, the important thing to remember is that the faster a new hire feels welcomed and prepared for their new job, the faster that employee will be able to contribute to the company’s overall success. As SHRM points out, employees who are onboarded using the sink-or-swim technique often struggle to figure out what is expected and how they can be successful in their new work place. When Should an Onboarding Program Begin and End? Studies have shown that organizations that provide new-hires with easy access to forms, employment information, and a view into the company’s culture prior to the first day of work benefit from enhanced employee retention, productivity, and overall satisfaction. Top companies use an onboarding portal to provide new hires with a comprehensive onboarding portal to provide new-hires with online access to company information, tax forms, policies, and company cultural information before they even start work. The length of an onboarding program varies from organization to organization and depends heavily on the complexity of the job responsibilities. 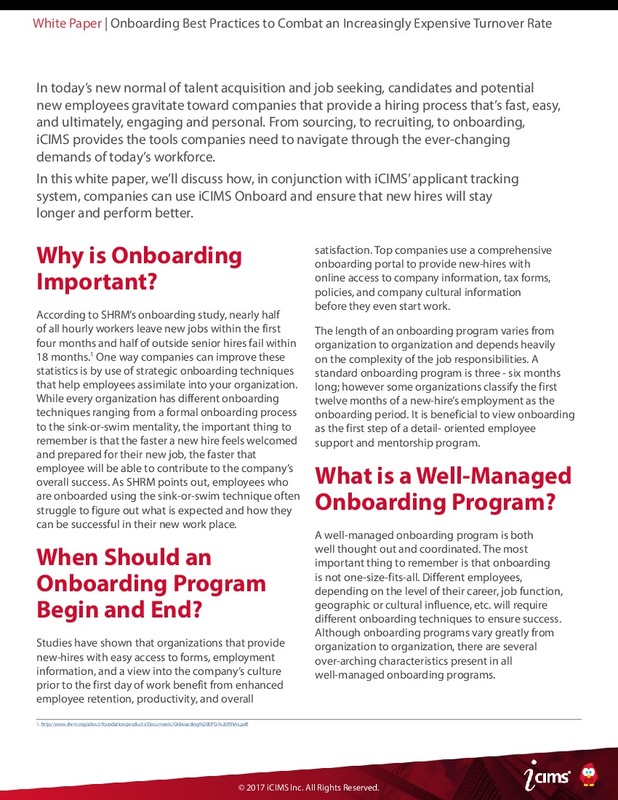 A standard onboarding program is three - six months long; however some organizations classify the first twelve months of a new-hire’s employment as the onboarding period. It is beneficial to view onboarding as the first step of a detail- oriented employee support and mentorship program. What is a Well-Managed Onboarding Program? A well-managed onboarding program is both well thought out and coordinated. The most important thing to remember is that onboarding is not one-size-fits-all. Different employees, depending on the level of their career, job function, geographic or cultural influence, etc. will require different onboarding techniques to ensure success. Although onboarding programs vary greatly from organization to organization, there are several over-arching characteristics present in all well-managed onboarding programs. One of the most important elements of a successful onboarding program is to focus on the new hire’s experience. The onboarding experience should be enriching, yet still simple. To accomplish this, onboarding requirements like forms and manuals should be presented in a clear and self-explanatory task-driven workflow. Additionally, the organization should not overlook the importance of introducing the employee to the company culture. This can be done using videos, images, and even biographical introductions to key people with whom the employee will work. Many organizations make the mistake of using the terms onboarding and orientation interchangeably. Onboarding is not orientation! Onboarding is an ongoing process of assimilation and integration, not a one-time orientation event. One of the most common onboarding mistakes is taking a cookie-cutter approach. With onboarding, one size does not fit all; it is important for every organization to implement an onboarding program that is closely aligned to their culture and ongoing business objectives. Some of the most successful organizations have automated their onboarding programs to further streamline their talent acquisition initiatives and increase their return-on-investment. The talent acquisition software used to automate onboarding programs helps to reduce preliminary recruiting costs, while improving employee retention and productivity in the long run. An automated onboarding program also eliminates reliance on paper documents and overloading new-hires with too much information, the majority of which they will not use for several months. Automated onboarding programs take advantage of an onboarding portal, a comprehensive and easily accessible location to store the documents necessary for the entire onboarding process. This gives new-hires the opportunity to access information when they need it- placing critical documents at their fingertips even before their first day of work. If your organization moves forward with an automated onboarding process, the onboarding portal contributes heavily to the new-hire’s opinion of the company. To get your new-hires off on the right foot, make sure that the onboarding portal contains all the relevant information that the employee will need. 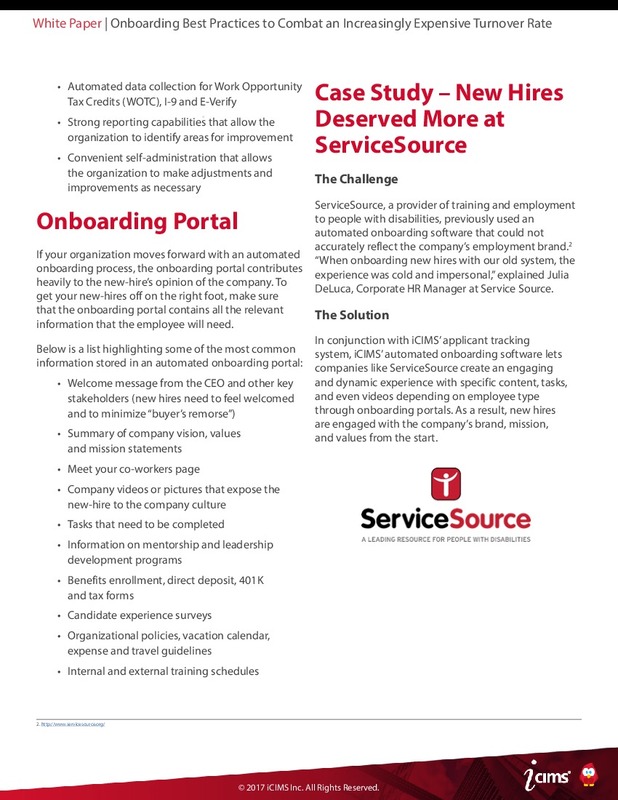 ServiceSource, a provider of training and employment to people with disabilities, previously used an automated onboarding software that could not accurately reflect the company’s employment brand. “When onboarding new hires with our old system, the experience was cold and impersonal,” explained Julia DeLuca, Corporate HR Manager at Service Source. In conjunction with iCIMS’ applicant tracking system, iCIMS’ automated onboarding software lets companies like ServiceSource create an engaging and dynamic experience with specific content, tasks, and even videos depending on employee type through onboarding portals. As a result, new hires are engaged with the company’s brand, mission, and values from the start.